Facebook has been always responsible in case of their Messaging app, the Facebook Messenger and they have provided many updates to the app, in fact a better number of updates in case of both quantity and quality. Over the next few days, Facebook won’t allow users to message from their default app in Android and iOS devices, and force all their users around the world to download its the Messenger app. Josh Constine from Techcrunch revealed that he got this information that people on Messenger reply 20% faster than other people who message from the main app or browser. Mobile web users, desktop users, feature phone and Windows Phone users can still message from their default app or browser. 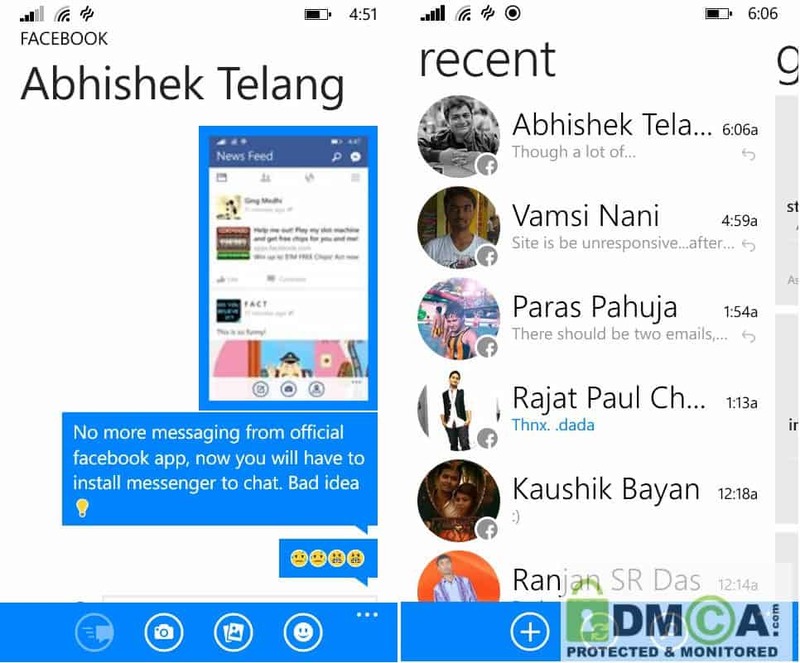 But technically, this feature is also may have got limited to some Windows Phone users, as i just now got my facebook beta updated and the ‘Messages’ tab got vanished and this tab was replaced by the new ‘news feed’ tab, and there is the messenger icon at the top right of the app, near the search button. 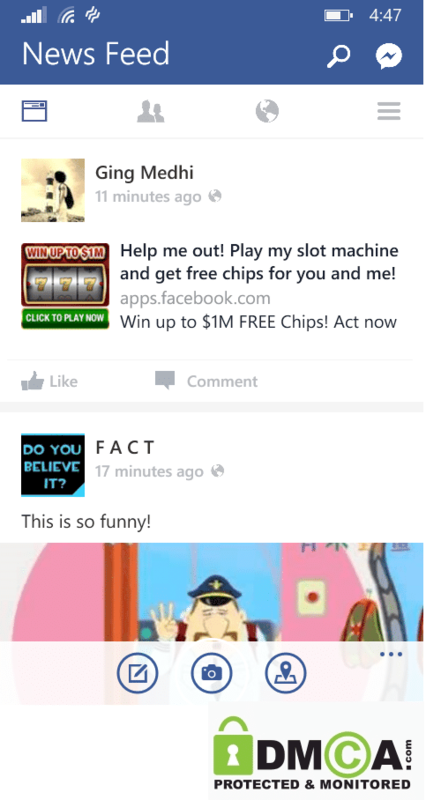 By the way, I’m using Windows Phone 8.1 Developer preview and also, the beta for the upcoming all new Facebook app. In the next few days, people will get notifications about this change when they open their Facebook app and also Facebook will email this to people explaining the reasons behind it. Messenger is now really a much cleaner, faster, more fun way to send Messages and it’s been getting better and better over the last few months. It recently added recorded video sharing, and a slick split-screen selfie button for quickly capturing Snapchat-style photos and videos. However, many people won’t care about that much as now, there are plenty other alternatives and people who use Facebook app to chat will definitely dislike this move. They can easily move to WhatsApp, BBM or Hike. Personally, other than Facebook for my personal communication I mostly use those three messengers, rarely use WeChat because it is slower and complicated, nor even LINE, but with the arrival of BBM Beta on my Windows Phone and WhatsApp, I can manage. Though, people who always stay online on Facebook and keep chatting on the go this is very essential.I think, now Facebook is pushing the limits, by forcing users to download the Messenger or else it’s not a bad move at all. It’s a fact that people send more photos, group messages, videos, stickers, and audio clips while using Messenger and this means that people are getting better experience from the Messenger. With 200 million users on Messenger sending 12 billion messages a day, Facebook wants to put all its efforts in the app that will combine messaging and media sharing simple. But at present, Mark Zucherberg is simply hurting the users by forcing this and they should be pretty careful about what people like and what they don’t. Download the Facebook Messenger. Just follow the Messenger logo below.